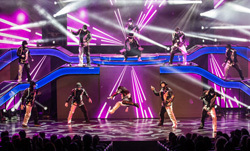 The world famous dance crew, Jabbawockeez, has returned to Las Vegas with their groundbreaking show “PRiSM” at the Luxor Hotel and Casino. Performed in an intimate, custom-built theater, PRiSM is a celebration of imagination blending awe-inspiring choreography, entertaining storylines, vivid costumes and chart-topping hits for a family-friendly production that will leave guests of all ages dancing in their seats. A one-of-a-kind style has been developed by Jabbawockeez that which has not only provided a new culture to the dance industry, but changed the way people view dance. The audience’s attention is guided away from individual identities through the use of expressionless white masks and white gloves, and toward a unified group to create a canvas for the audience to visualize the music by painting artistic imagery through their intricate moves. Since Jabbawockeez was crowned the original champions of MTV’s “Randy Jackson Presents America’s Best Dance Crew,” their captivating style and unmatched talent quickly became a fan favorite. Through their coveted title, they have appeared on numerous television shows including “So You Think You Can Dance,” “Dancing With The Stars,” “The Ellen DeGeneres Show,” “America’s Next Top Model,” “Regis & Kelly,” “The TODAY Show,” “E! News,” and “MTV”.